Is boxing legend Muhammad Ali immortal? A whirlpool of emotions swept through my mind when I heard Muhammad Ali is no more. I felt as if I was knocked out and was in a daze for several hours, like most of his fans who dreaded hearing this news. Having hero worshipped him as a young boy, I wished he would remain immortal. After the initial shock, I was reminded that Ali was a mortal like all human beings but his deeds would remain immortal. So when people ask me whether I felt sad at his passing, my reply is we should be happy that a man who had bravely endured suffering from Parkinson's disease for over three decades had finally answered the call from God. We should be inspired by the monumental achievements of a scrawny black kid from Louisville Kentucky who charmed the world not just with his boxing skills but with his braggadacio, wit, poetry and above all his love of humanity. Ali must be at peace with himself and chuckling as everyone from Barack Obama to his legions of fans scramble to sing his praises. He was a man who virtually scripted his own destiny at least for the first-half of his life. No amount of eulogies or tributes will do justice to a sporting legend who was ahead of his time. He strode like a colossus and ruled the universe like no other the world has ever seen and, I doubt, will ever see. The battles he fought both in and outside the ring and the sacrifices he made for what he believed was right, have been well chronicled and documented. The first real Peoples' Champion, the legacy he has left behind will live on in the hearts of those to whom he endeared. He is still the most recognised face with a smile that brought hope and joy to millions on this planet. He is loved not because he became a Muslim or was a boxing genius. But ever since he burst into the limelight he 'shook up the world' and changed the way people looked at boxing. He brought sweetness to a brutal sport, not just with his ring artistry but with his beautiful persona, which appealed to people from all walks of life. Titles rested lightly on his giant shoulders for he never lost the common touch despite being famous to become the first citizen of the universe. He goaded his erstwhile rival Joe Frazier to produce the first million dollar bout in the 'Fight of the Century'. He never ducked a challenge and fought with a broken jaw against Ken Norton. He invented the rope a dope to topple George Foreman and defied death to win the 'Thrilla in Manila' against Frazier. The first time I saw Ali fighting on television was when he beat Leon Spinks in the rematch to become the first heavyweight to become champion for the third time. I watched with sadness when he was beaten by his former sparring partner Larry Holmes. But Ali did not retire because he wanted to entertain his fans and fought one more time. There are many such defining moments in the life of Muhammad Ali aka Cassius Marcellus Clay. 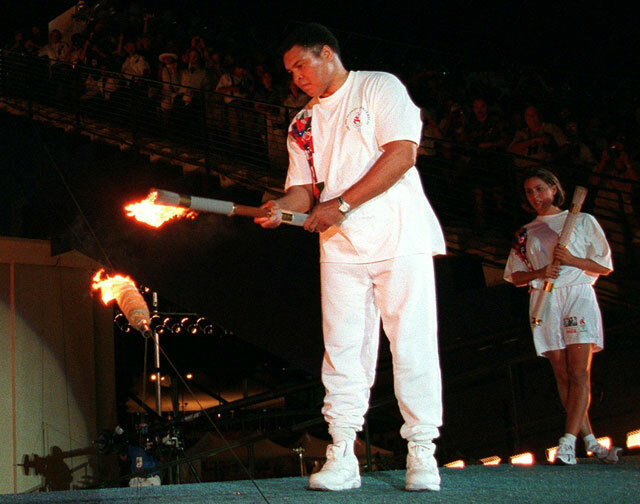 One of the most iconic moments in sporting history was when the world witnessed Ali raising the Olympic Torch in 1996 with quivering hands in an ultimate act of bravery. That to me remains an endearing memory of Ali than all the punches he threw. A man who always dared to do the impossible and lapped up the adulation of fans in whose hearts the self-styled 'The Greatest' will live on forever.